How do you improve upon an afternoon of spas, saunas, and massages? You follow it up with a big ol’ bowl of hearty, good quality pasta of course! And so that’s how I found myself at Fratelli Fresh after an indulgent afternoon at Onsen Ma, courtesy of Chris as a late Christmas present. Because as it turns out, an afternoon of relaxing is incredibly hard work(! ), and I was keen for some sustenance by the end. 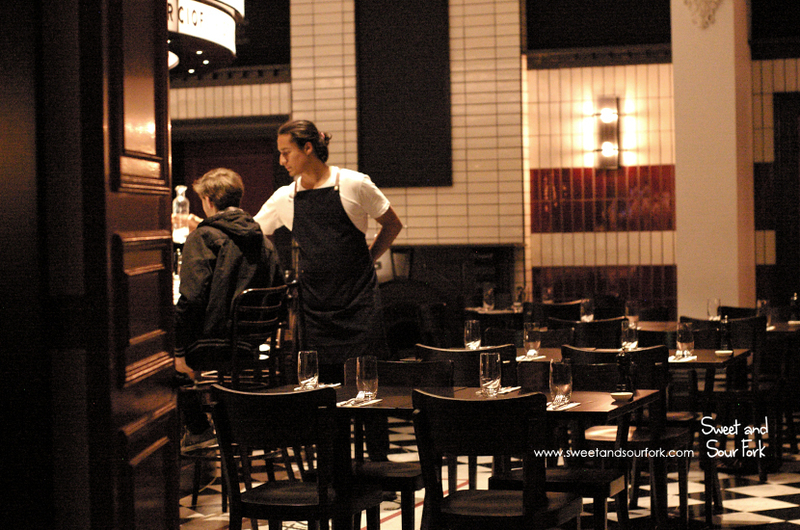 Fratelli Fresh is an Italian restaurant chain with 7 locations in Sydney, but you wouldn’t be able to tell just by looking at it. Located in a grand old building in the middle of the CBD, it is fitted out beautifully in a glamorous, old-school style. The floors were tiled with marble, the furnishings were polished wood and rich, red leather, and everything was cast in a warm glow from the lamps sitting in sconces along the walls. 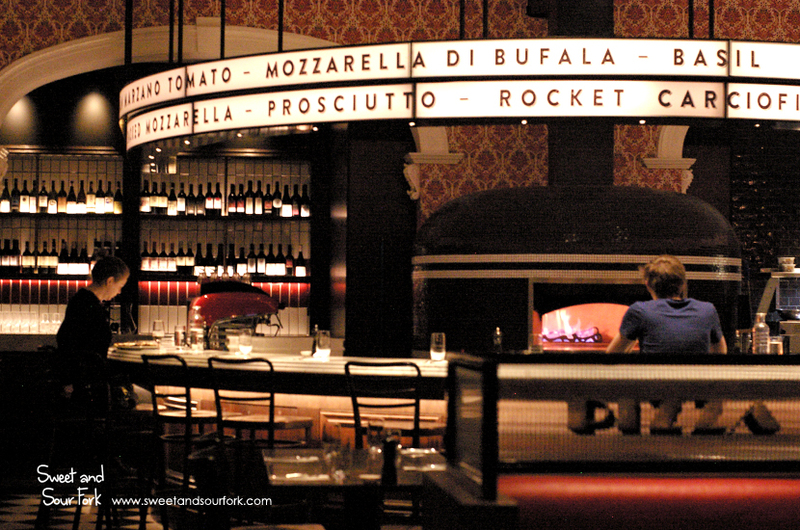 But I think we had the best spots in the house – on the semi-circular marble bar surrounding the pizza kitchen, bathed in the warmth of the wood fire oven. 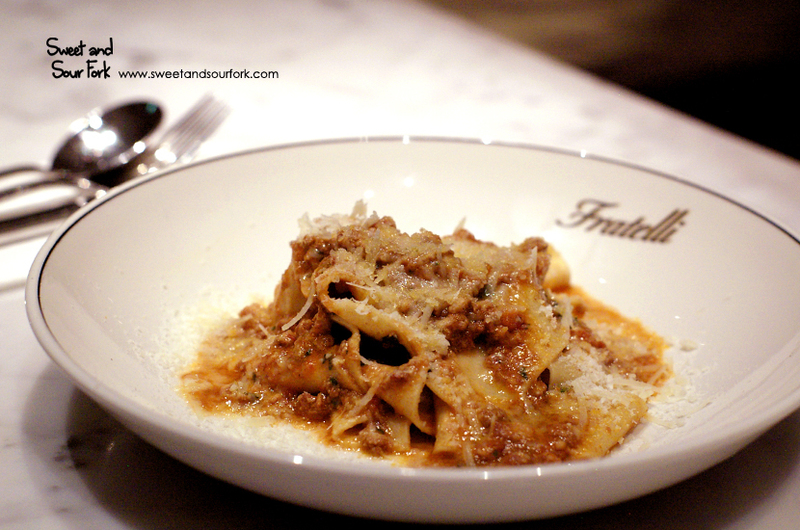 The Pappardelle Ragu Bolognese ($23) is almost always a safe and delicious bet, yet I wasn’t a fan of this one. Although the pasta sheets were smooth and pliant, they were also oddly flavourless, with none of the wheaten, eggy aroma you’d associated with good pasta. The ragu was similarly disappointing, tasting quite watered-down and had a powdery mouthfeel to it. Chris however though the dish was perfectly nice, so I guess there’s nothing for it but for everyone to decide for themselves. 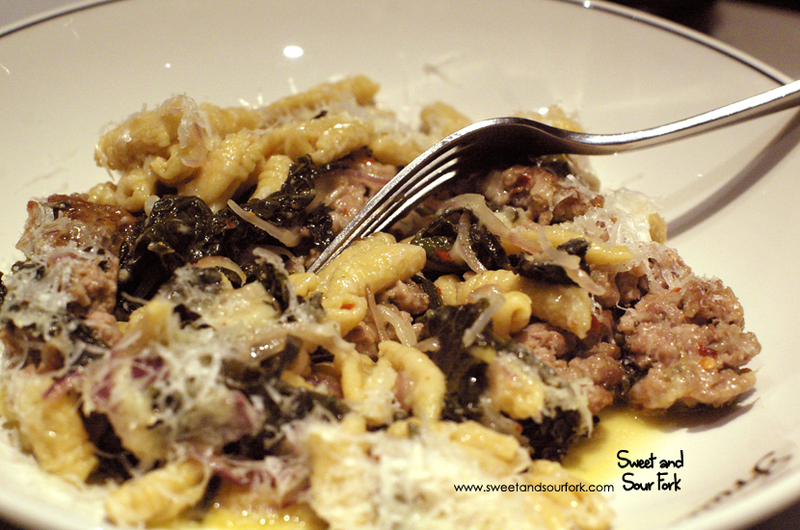 The Cavatelli with Sausage, Rapa, Chilli and Onion ($23) on the other hand was delectable. The chewy little nubs of pasta were a perfect al dente, tossed through with a bold combination of chunky pork sausage, bitter rapa leaves, finely shredded onion, and a hint of chilli. 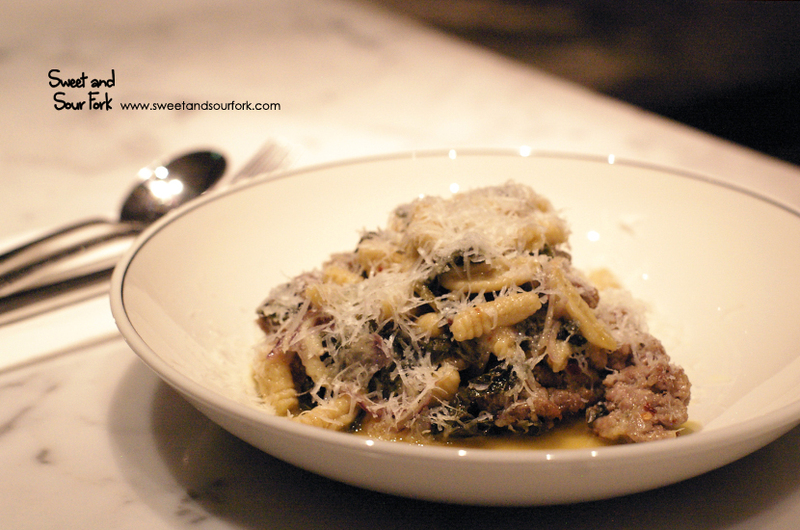 Covered with a flurry of salty parmesan, this was definitely one of the best pastas I’ve had in recent memory. Fratelli Fresh was a bit of a mixed bag. It had its great bits, but was let down by the subpar pappardelle for a somewhat above average price. More’s the shame, because I really wanted to find a new go-to pasta spot. 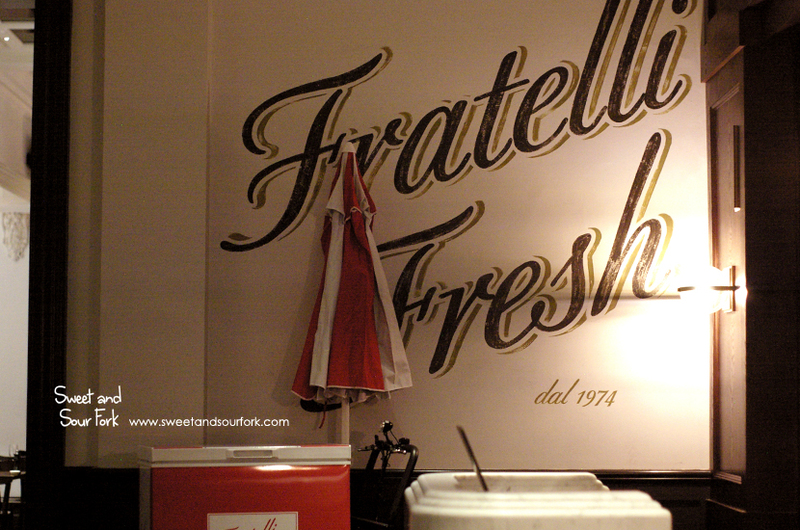 Rating: 13/20 – fratelli fresh-ish.